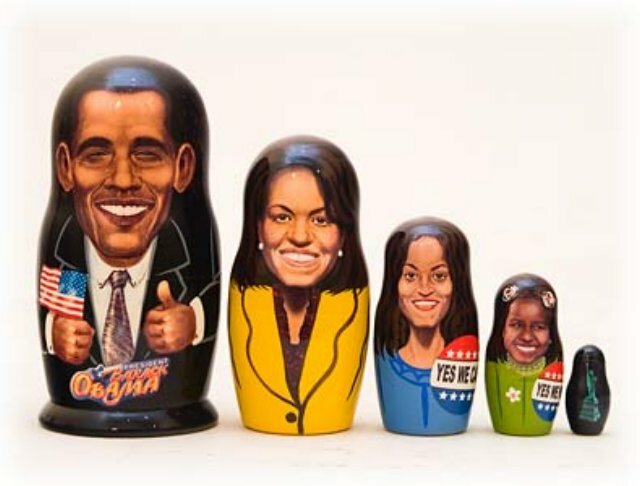 Russia welcomes the Obama family to the White House with this nesting doll. President Barack Obama, First Lady Michelle, daughters Malia and Sasha, and the Statue of Liberty all nest together. Barack Obama holds the American flag and gives a thumbs up. Turn him over to find his entire Inauguration Day speech written on the back! Michelle is dressed in her yellow Inauguration Day dress. Malia wears a button that reads "YES WE CAN!" and Sasha wears a button that reads "YES WE WILL!" The perfect momemto of this time of change. Hand painted and decoupaged at the Golden Cockerel workshop in St. Petersburg, Russia.